The Embody Housing is constructed of structurally embossed, 22 gauge cold rolled steel. Shallow, light housing for easy installation. Post painted body with smooth sides for safe handling. Extra reinforcement in the body to create additional rigidity. Superior mechanical and gasketed light seal to eliminate any light from escaping; therefore, utilizing all the recycled light available. Integral T-Bar clips to secure fixture to T-Bar system. Earthquake clips provided standard. Wireway channel provided. Long life LED’s and high efficiency drivers work together to provide superior performance in an efficient package to deliver optimal performance. 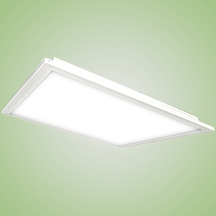 LED’s available in 3500K, 4000K and 5000K with a CRI >82. Electronic drivers are available in 120/277 volt applications. 0-10V dimming as well as 50% step dimming capabilities comes standard. When in the step dimming 50% position the 0-10V leads may still be utilized for further dimming control. Remote mount capable driver is provided in a separate enclosure. ETL listed. LM79 and LM80 tested. This product is classified as Exempt based on the Photobiological safety evaluation report according to IEC/EN 62471.